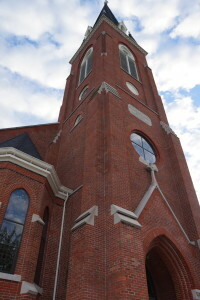 While the groundwork was laid earlier, Saint Gabriel Catholic Church officially began in 1851 when the first trustees of the church were appointed, according to church historians. Foundation for the first Saint Gabriel was laid in 1851. In October of that year, the first of an estimated 123,000 bricks were laid at the site on the west side of Eastern Avenue where two lots from the railroad tracks north to Eleventh Street were donated by Abraham B. Conwell. Reverend William Doyle, a resident priest who lived in Richmond from 1848 to 1853 and visited Connersville regularly, is credited with having the first church built. Anthony Apert, who operated a wagon shop near his home in the 400 block of Eastern Avenue; Valentine Michael, who owned a copper shop on the west side of the canal near the northwest corner of Fifth Street and Grand Avenue; Daniel Cohine, a canal laborer; and George Heinemann, a grocer, whose store was located at the southeast corner of Fifth and Market Streets at the time, were appointed trustees of Saint Gabriel Church in 1851. A congregation of fourteen families and several single men gathered for services in Apert’s home while the church was being built. Reverend Henry Peters became the first resident priest of Saint Gabriel, serving until his death in 1874. Father Peters was housed in the Apert home until 1858 when, under his direction, the first rectory was built at the corner of Eleventh and Eastern, where the V.F.W., Veterans of Foreign Wars, Lodge now stands. Father Peters also established the first Saint Gabriel School. He opened a school in the back room and basement of the church in 1854, and moved it to the parish house after it was completed in 1858. He lived long enough to see his dream of a new two-story brick school for the children of Saint Gabriel built. It opened for the term in September 1873 on West Ninth Street, the site where the present school is located. A new church was also in the planning by Father Peters before his death in 1874. The small size and location of the first church near the railroad became impractical, and in 1881, the lot on the corner of Ninth Street and Milton Pike, presently Western Avenue, was acquired and the present church building was begun. From 1874 to 1881 two priests, Father Peter Bishof and Father B. H. Seepe administrated to Saint Gabriel. They enlarged the original church by using the balcony for pews. 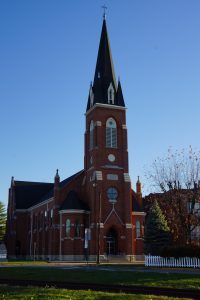 Father F. J. Rudolf (1881-1906), successor to Father Peters, built the present church building which was dedicated on June 15, 1884 by Bishop de Saint Palais of Vincennes, who was instrumental in creating interest in the building of the original church. In 1890, the present parish office was built (it was the rectory). The Right Reverend Theodore S. Mesker served from 1906 until 1927. During his pastorate the beautiful art glass windows depicting the 15 Mysteries in the life of the Lord were installed in the 1920’s. The windows on the west wall depict the Joyful Mysteries and on the east wall depict the Glorious Mysteries. The large windows in the east and west transepts represent the Sorrowful Mysteries, ending with the Crucifix on the North wall behind the altar. During Father Mesker’s time at Saint Gabriel, he also started construction of the school building (now called the 1926 building), which includes the gym and auditorium. Cornerstones for that building were laid in 1926, shortly before the Reverend Mesker died in early 1927. Construction of the addition to the 1926 school began in the late 1950’s while the Reverend Arthur Mooney was pastor at Saint Gabriel. Located on the east side of the old school, the new facility was completed in 1958. September 30, 2001, the parish celebrated it’s Church Sesquicentennial with Archbishop Daniel Buechlein, Father Stanley J. Herber and Father Joseph Riedman. The celebration started with liturgy based on Saint Gabriel’s Feast Day and a catered dinner was held at Robert’s Park. In April of 2002, Archbishop Daniel Buechlein along with our Pastor, Father Stanley J. Herber, dedicated our newest school addition, which included new offices, two spacious classrooms and a multipurpose room. During the construction of the new addition, the 1957 building was also remodeled. That completed phase one of a three phase building program. The Property & Facilities Committee decided to move along the building program and renovated the rental home (formerly the custodian’s house) for the rectory. In November 2001, renovation was started on the old rectory to make it the new parish office. In 2004, Jim Pflum donated the Saxon Property in memory of his deceased family members and his children. This gave Saint Gabriel Parish all the property in the block bound by Western Avenue, Ninth Street, Grand Avenue and the railroad. That summer we the old parish office (Annunciation Hall) and the Saxon house were demolished. August 28, 2004, the school celebrated its Sesquicentennial with a Mass followed by a dinner and school open house. Father Dustin Boehm, who became Pastor of Saint Gabriel in 2014, is the seventeenth Pastor at Saint Gabriel.